A lot of people love to redecorate their homes. Some even have really exquisite taste. Even those with great taste can make simple mistakes, though. When you begin a decorating project, think of all of the things the room has to do to function. In a bedroom, we rest, we dress, and sometimes we play or read. The room needs to function accordingly. The first cardinal rule of function is scaling appropriately. If you must have a king sized bed, make sure that your accompanying room is big enough to pull it off. There's nothing more uncomfortable than a bedroom with no room to move. Also, make sure that you don't have dressers or night stands that are too short or small for the bed. Some people read and unwind with a beverage in their rooms before they doze off. If your night table or night stand is more than a couple of inches shorter than the height of the bed, you'd find yourself getting up and UN-relaxing to put a book or glass down. 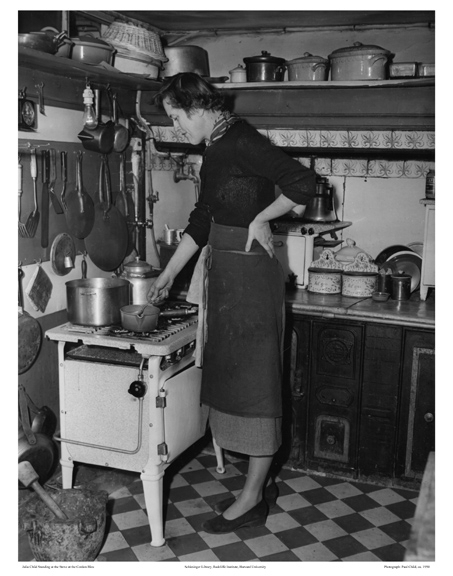 Julia Child is a GREAT element in any room. Notice how the scale of these kitchen counters and stove just don't really work. It's kind of obvious, right? She was a trooper, wasn't she? Love her. Next is a photo used in Southern Living magazine with more subtle scale errors. There was a professional designer involved. It's a beautiful room. Lovely headboard. The color scheme is monochromatic gold. GREAT concept. The night stand nearest the window: perfect size. The drapes: perfect length. The bed is scaled appropriately to the room size. GREAT! Just a few things miss the mark with scale, but it is enough to make the eye a bit unfocused or uncomfortable. The chair by the window? First of all, it doesn't allow for the night stand to open if there's a drawer or be seen and it looks like a nice piece of furniture with nice lines. Secondly, the chair, though it is lovely, is too short and looks dwarfed by the bed. Placing it even in a pair somewhere else in the room wouldn't work because the scale of the chair, it's height and width, are just not right in a room with THIS large of a bed and ceiling height. Putting a bench at the foot of the bed would work better in this space, or putting a chaise or settee or couch elsewhere. The skirted table has a really awesome potential. It's height is right, but it's scale RIGHT next to the bed is off-putting. It should be a bit more substantial next to this magnificent headboard. There are other things wrong with this design, but we'll revisit that later. Let's visit a room that is right as rain. Here is a room found in Cottage Living. This is not a huge room. The designer paid attention to where the traffic patterns were in the room and left an appropriate space for paths. (Which is cardinal rule #2. The official rule is to leave 36 inches -3 feet- for walkways that lead to or away from doors and 18 inches between furniture pieces to pass through like a couch and coffee table.) The bed is sized and placed appropriately and there is space for the room to function as a dressing area and a reading haven. There's even storage in the wicker trunk at the foot of the bed. The major functions of the room are addressed perfectly. The scale of every single lamp, chair, accessory in this room are spot on. This is why, even if you don't like wicker or white rooms, even though there are a lot of things out, you'll be able to look at this photo and feel somewhat relaxed. It's all about scale. Let's look at another room and see what we can learn from it. Veranda magazine published this gorgeous room. It is a fairly large room with high ceilings. Normally two twin beds could be easily dwarfed in a room this large. The designer was brilliant and chose to extend the bed with benches the perfect width of each bed. Drawing the eye further outward and upward with the benches and the cornice canopy over each was the crowning achievement for making this room successful. There are lessons we can and will learn from this room about light and color and contrast another time. 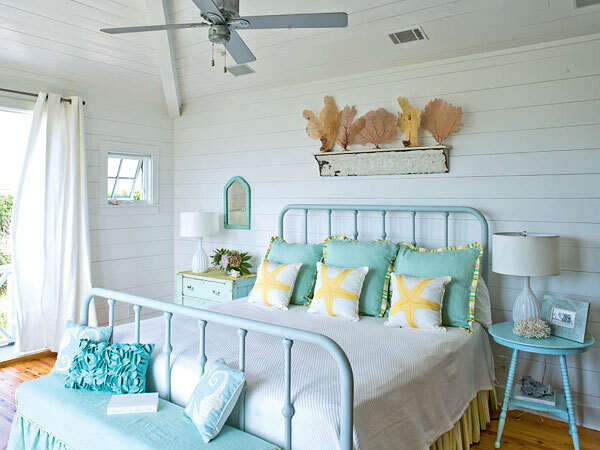 Coastal Living published this photo, and the room is successful for a variety of reasons. Look at the furniture pieces in the room and note how appropriate their size is to one another. Can you see it? Even for a girl who really doesn't enjoy white as a predominant color choice, this room makes me happy. Have you ever struggled with scale and not realized it? Tell me about your successes with scale and placement. I want to hear from you about this topic! Ooo, loved reading this! Scale is not something I think of much when decorating. So much to learn! Syd, keep reading. We'll cover more about the rules that matter in design. Frankie, thank you for reading my blog! Thanks for liking it!! I have a LOT to learn about blog appeal still. Can't wait to see yours! Brave Girls, UNITE!